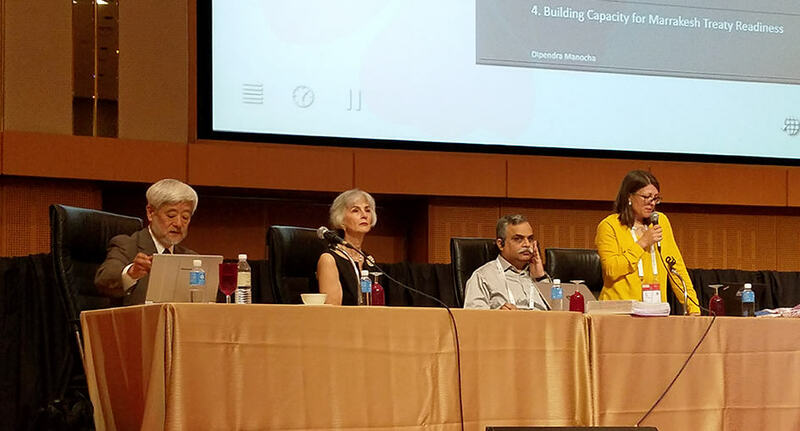 “Marrakesh Treaty in Force” presenters, from left: Hiroshi Kawamura, Victoria Owen, Dipendra Manocha, and moderator Kirsi Ylänne. The Marrakesh Treaty was established in 2013 by the World Intellectual Property Organization (WIPO) to allow copyright exceptions for creating accessible works for visually impaired persons. As it is ratified by more United Nations member states—41 so far—how can libraries make use of it to benefit patrons with print disabilities? 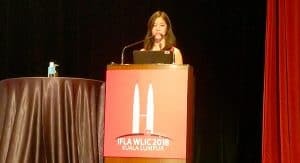 That was the focus of the “Marrakesh Treaty in Force” session August 27 at the International Federation of Library Associations and Institutions (IFLA) World Library and Information Congress in Kuala Lumpur, Malaysia. The moderator was Kirsi Ylänne, accessibility specialist at the Celia Library, a national center for accessible literature and publishing in Helsinki, Finland, and chair of IFLA’s Libraries Serving Persons with Print Disabilities section. Victoria Owen, chief librarian at the University of Toronto Scarborough, provided an overview of several guides on Marrakesh implementation—published by IFLA, Electronic Information for Libraries (EIFL), the World Blind Union (WBU), and other organizations—and their target audiences and purposes. 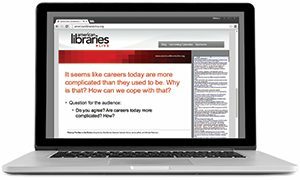 Some guides are geared for libraries and librarians, while others are more suited for government decision makers and development partners. When choosing a guide to help with implementation, she advised avoiding any that seek to narrow the interpretation of the treaty, such as those produced by publishing groups. Owen previewed the latest guide, IFLA’s Getting Started, a practical guide for implementing the treaty at the library level that is available online in English, French, and Spanish. Owen and her editorial team are looking for librarians to translate the booklet into other languages and customize it with their countries’ specific Marrakesh statutes. (Ylänne is spearheading the Finnish translation.) “Without libraries, Marrakesh would not be implemented,” Owen said. Hiroshi Kawamura, founder and president of the DAISY Consortium, a group of international organizations committed to developing equitable access for persons with print disabilities, argued that ratification of the Marrakesh Treaty is just a beginning. The goal is to create and promote born-accessible content that is affordable and usable by all, not just for print materials, but also for television programming, web browsers, and other media. One important aspect to consider, Kawamura said, is the infrastructure for global sharing of resources. The current system requires internet access and a digital network. Without that, implementation can’t work. Another important facet is the creation of sustainable business models for accessibility. Ratification and revision of copyright law may allow us to reproduce reading materials but it provide no resources for doing that. Developing countries especially need international partners to help with implementation, he said. Anthea Taylor, manager of accessible information library services for Vision Australia, explained the WIPO Accessible Books Consortium service and demonstrated its online functions. Its catalog holds 361,000 titles in multiple languages and allows libraries to check out books from around the world using only one service contract if both countries have ratified the treaty. India was the first country to ratify the Marrakesh Treaty in 2014, and Dipendra Manocha, president of DAISY Forum of India, detailed how the forum worked with WBU and other organizations to meet with political leaders and publishers, raise public awareness, and demonstrate to help get the law passed. After ratification, getting accessible devices and content in local languages into the hands of users has been an ongoing challenge. Some 200,000 visually impaired people have benefited from such technology as text-to-speech engines and DAISY players in many Indian languages that connect to online libraries. The Sugamya Pustakalaya online library and Bookshare offer 400,000 books in 22 national languages of India. Having books available in their own languages from authorized entities around the world, thanks to the treaty, helps not only people with blindness in India but in the Indian diaspora globally, Manocha said. David Ramírez-Ordóñez, librarian and researcher at the Fundación Conector in Bogotá, Colombia, reported on his team’s work on treaty ratification efforts in Latin America. So far, only Uruguay has ratified, but Conector and other organizations are raising awareness and advocating among librarians though Wikipedia 1Lib1Ref events and other efforts. In “The Role of Government and Law Libraries in Times of Crisis and Turmoil,” sponsored by IFLA’s Law Libraries and Government Libraries sections, presenters expressed the unique role law libraries play during times of political and even environmental change. Law Librarian of Congress Jane Sánchez explained that 60% of the Law Library of Congress’s (LLC) collection consists of non-US legal materials. LLC maintains offices abroad to collect materials in other countries, including difficult- or impossible-to-find law titles. After the Taliban’s destruction of materials in Afghanistan in 1996–2001, LLC helped reconstruct the Afghan legal system. It has digitized 163,000 items that now reside in Afghan universities and museums, dating from the 14th century to the present as part of its “virtual repatriation” World Digital Library project with UNESCO. Yolanda Patrice Jones, director of the law library and a professor at Florida A&M University College of Law in Orlando, spoke about the library’s special social justice mission. As both a law library at a historically black college and university (HBCU) and the public law library for the community, it provides support and information to the local legal community and to people representing themselves in court. Jones has developed a continuum of library access to justice services, ranging from basic services (general reference services, non–law librarian, self-help guides), through intermediate services (law librarian, legal reference services, law collection, legal forms, legal databases), to advanced services. 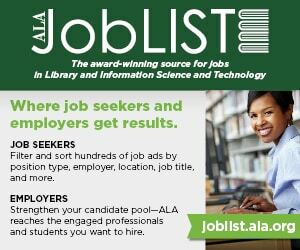 The library offers few advanced services, primarily because of low staffing levels and limitations on giving legal advice, but it makes available automated legal forms such as those on lawhelp.org. Edita Bačić, director of the library for the University of Split Faculty of Law, Croatia, used the concept of neutrality to frame her presentation on law and ethics. Neutrality played a role in the development of librarianship and should still be used as a way to treat patrons, but it no longer works for social justice issues related to librarianship, she said. 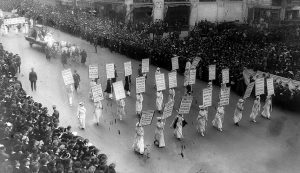 Political decisions related to human rights and access to information do impose restrictions on the library community, but activism and leadership for change are expected from librarians in turbulent times. IFLA adopted its Code of Ethics for Librarians and Other Information Workers in 2012, but Bačić said she finds its neutrality principle contradictory. She cited alternative approaches around the world to librarian ethics, including the Progressive Librarians Guild and the Occupy Wall Street library.